This is an extremely rare plant found only in the mountainous parts of the Eastern Cape (South Africa). Belongs to the family of Rooibos. 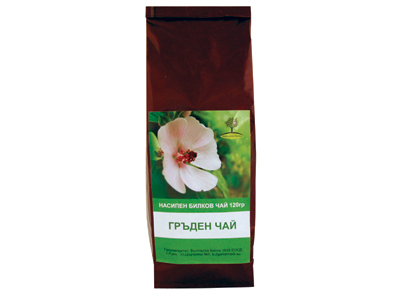 Has a very pleasant aroma and naturally sweet taste. Content: Contains leaves of Cyclopia Intermedia - Honey Bush (Copper bush). Honey bush tea is rich in isoflavones, kumestans, luteolin, flavones and many other bioactive flavonoids. It has been found that these compounds have antioxidant properties. Effect: The bioactive substances in the tea Honeybush promote regulation of the menstrual cycle in women and reduce the risk of cancer of the breast and uterus as well as osteoporosis. Reduce the risk of prostate cancer in men; help detoxify the body and help protect the liver from harmful impacts. Stimulate bowel function and reduce the risk of constipation. Calm in stress situations and nervous tension, suppress craving for sweet foodstuffs. Flavonoids have beneficial effects on lipid and carbohydrate metabolism and help maintain healthy cholesterol and blood glucose. Exhibit antimicrobial, antiviral and antifungal properties. Usage: Honeybush tea is completely natural, with no preservatives, artificial colors and stimulants. It does not contain caffeine. Can be consumed in unlimited quantities. Can be perfectly combined with Rooibos.